This year sees the 150th anniversary of the birth of the Scottish pianist Frederic Lamond. In tribute, APR have release this three-CD set of his complete electrical recordings. They include the Liszt discography, which has been previously issued by the label on a single CD, and was reviewed here. For this new incarnation, the Liszt acoustics are included. Frederic Lamond was born in Glasgow in 1868. By all accounts, his background was an impoverished one. His brother David provided his earliest piano tuition. At the age of 14 he was enrolled at the Raff Conservatory in Frankfurt as a pupil of Max Schwarz and later Hans von Bülow. At the suggestion of the latter, he became a pupil of Franz Liszt in 1885. The composer was to die a year later. Around the same time Lamond made his Berlin debut. This was followed by concert appearances in Vienna and Glasgow. He initially forged a career in Germany, with a repertoire that focussed on Beethoven. In the 1920s he toured the States and worked briefly as a professor at the Eastman School of Music, in addition to a post at the Hague Conservatory in the Netherlands. With the approach of war he fled to Switzerland. In 1940, now in his seventies and with money short, he returned to Glasgow. He earned a living teaching at the Glasgow Academy of Music, and even on an old upright piano in a music shop. Another source of income was the odd concert performance, and nineteen radio broadcasts for the BBC. He died in Stirling in 1948. It is no surprise that Lamond’s Liszt performances gained the imprimatur of the composer himself. Later, when he came to record some of them, he was already over fifty. The earliest acoustic inscription dates from September 1919 for HMV. It is the Schubert/Liszt Erlkönig, proving that his technique was still in fine fettle. Gnomenreigen and Un sospiro followed in November 1921. With these he said farewell to the acoustic era. 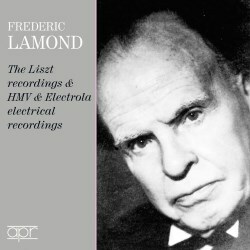 Like many artists, Lamond remade recordings, again for HMV, in the new electrical era. We have multiple versions of Erlkönig (2), Gnomenreigen (3) and Un sospiro (4). The 1936 version of Un sospiro lacks the pace and gleam of the earlier versions. The electrical remakes of all are, needless to say, in much improved sound. The later recordings, dated 1935-1936, were made in Germany. They sound marvellous, and showcase the bloom and richness of the pianist's tone to perfection. Sample the Liebesträume No. 3 and you will see what I mean. The Liszt discography contains a couple of impressively played rarities in the shape of the Valse-Impromptu and the Rossini/Liszt Cujus animam. One can marvel at displays of dazzling virtuosity in the Tarantelle di bravura from Auber’s La Muette de Portici, Tarantella No. 3 from ‘Venezia e Napoli’ and Feux follets, all three recorded in 1929 when Lamond was 61. Beethoven held a central place in his repertoire, and his performances of the composer’s music were highly regarded. At the Wigmore Hall in 1945, he was billed as ‘Lamond – the greatest living exponent of Beethoven’. He made the first ever recording of Beethoven’s Emperor Concerto, acoustically in 1922. He also set down the Waldstein, Appassionata and Moonlight acoustically, and we are fortunate that he remade all three in the electrical era, which is what we have here. For me, his Beethoven recordings are a mixed bag. The Tempest, Appassionata, Waldstein and Op. 110 I like very much, though each lacks the probing depth of Schnabel and spiritual dimension of Kempff. The sonatas I have trouble with are the slow movement of the Pathetique, which sounds matter-of-fact and pedestrian. The Sonata No. 12 in A flat major, Op. 26 is marred by desynchronisation of hands in the opening movement theme. Variation 4 sounds very odd to me, rhythmically flaccid with misplaced accents. Of the single pieces, there is a captivating Chopin Nocturne in A flat, Op. 32 No. 2, and a buoyant Capriccio in B minor, Op. 76 No. 2 by Brahms. Liszt’s Un sospiro and Gnomenreigen make a final appearance in May 1941, this time for the Decca label. The latter piece sounds, by this late stage, on the cautious side. The expert transfers by Andrew Hallifax and Bryan Crimp breathe new life into these historic documents. For completeness, APR have harnessed some tracks from the Biddulph label. The excellent, informative annotations come courtesy of Jonathan Summers. This set constitutes a handsome 150th anniversary tribute.